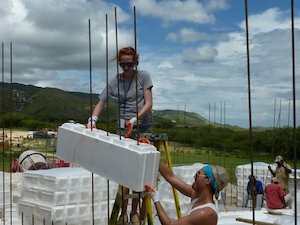 The unique “Lego” type design of the Lazarian polystyrene Insulated Concrete Forms (ICF) provide modern energy-efficient housing. The major components of the Lazarian World Homes are Green in the true spirit of eco-friendly housing. The homes stay warm in the winter and cool in the summers. All Lazarian building designs have a 20-25 R-Value and an Economic Life of 40-50 years. The wall systems of the homes comprise Lazarian polystyrene (EPS) foam blocks, concrete and steel rebar, a sustainable solution to cost effective, energy efficient housing for the needy. When the economic life of the Lazarian home is complete, approximately 90% of the home may be recycled, including the Lazarian EPS foam blocks, concrete, rebar, metal roofing, and wood. In places where use of wood is not available or desirable, roof truss systems may be built with recyclable steel angle iron or aluminum. Lazarian World Homes are simple and inexpensive to build. With minimum training, families are able to build their own homes. On-site Instruction is provided by Lazarian staff. Because the walls of a completed Lazarian home have cells filled with concrete and steel reinforcing bar, the resulting structure inside the walls of a Lazarian building is commonly referred to as Reinforced Concrete Post and Beam Construction. This is one of the strongest methods of construction known to structural engineers. Lazarian homes will withstand major earthquakes, storms and natural disasters. The walls are waterproof and are easily cleaned after a flood. The blocks also contain a fire retardant and pest repellant. Buildings have been erected in California, Haiti, Mexico, Honduras, Brazil. Plans have been made for projects in Armenia and Indonesia.